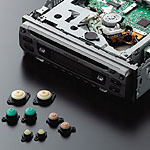 The liquid seal type anti-vibration rubber we have developed makes it possible to mount precision devices such as CDs and HDDs in automobiles. 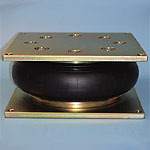 The air spring (SUMIMOUNT) is widely used to prevent vibration in high-speed vehicles, and is gaining popularity as an actuator. 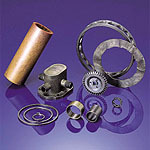 High-strength resin (AURUM), with a strength equivalent to metal, is being greatly considered for use in automobile components, etc. 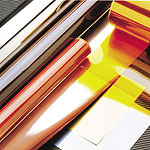 Our laminated film is a combination of various resin films and copper or Al, etc. 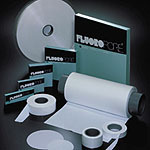 This film is commonly used in fields from electronic industries to foodstuff fields. Poreflon membrane (ethylene tetrafluoride), with excellent heat resistance, chemical resistance, water repelling properties and flexibility is often used as a filtration membrane, filter or breathing valve. 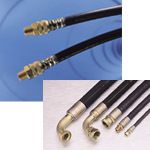 High-pressure hoses are essential for maximizing the hydraulic force of shovels, cranes and machine tools, etc.